Wow! This was our first time installing lighting for a wedding in the barn at Stonehill House near Abingdon. What a lovely barn! We worked with the bride to create a lighting and décor scheme that worked with the barn's existing features and lighting, settling on this fabulous combination of two crystal chandeliers with up-and-over voile drapes and fairy light wound pillars and swags. The barn's layout would also lend itself well to other lighting designs, which are summarised here. We'd be delighted to work at Stonehill House again. 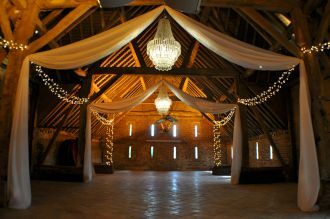 Please feel free to contact us to discuss lighting ideas for your wedding in this gorgeous barn.